Badih Fattouh is the CEO/Founder of Creative Venture. Prior to this, Badih Fattouh was Group Director of Content at the Middle East Broadcasting Centre, UAE (since September 2004). His responsibilities involved managing and supervising the group content (mainly drama) investment across Arab countries as well as managing MBC1 content acquisition and commissioning functions. 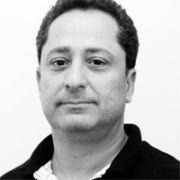 Preceding this appointment, Fattouh was Deputy General Manager at 03 Productions, a subsidiary of MBC Group (January 2002 - August 2004) and prior to this the Acquisition Manager at MBC1 (March 1999 - July 2003). He has also held high level positions at Trans World Television (April 1997 - January 1999), Sabbah International Video Corporation (March 1995 - March 1997) and Future Television (September 1992 - February 1995).